A few years ago my father-in law gave me about 2kgs of plums. I like plums but am not a fan of them cooked, so I had to look at a way of using them up other than stewing and freezing them! I heard about this book on jams and chutneys on Women’s Hour (which I love by the way, and not just for the cooking features!) and I’m so glad I ordered it. It has recipes using what you have preserved, which is great, because who knows what to do with poached pears otherwise? 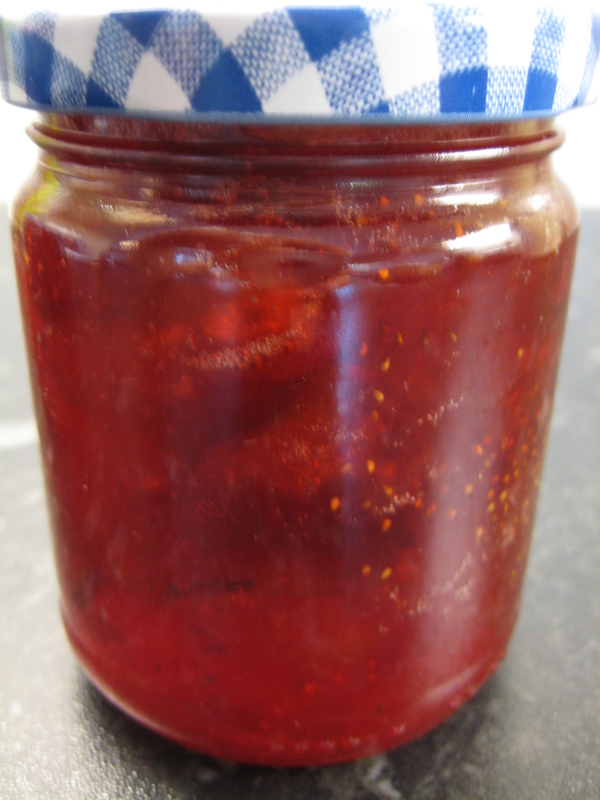 I love the colour of this jam. Looks yummy! Anyway, plug over! 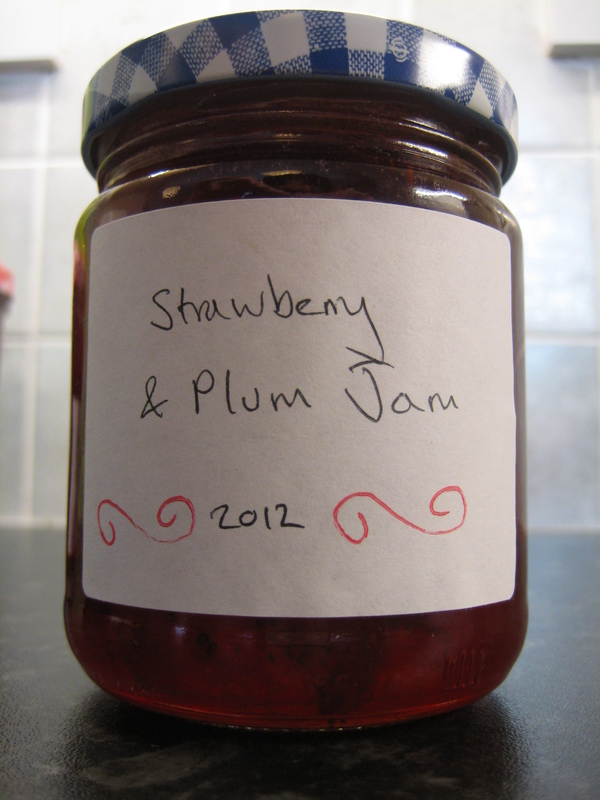 I have been making my own jams and chutneys ever since and have made plum and blueberry jam a few times. Well this year it was time for a change, and I happened to have some strawberries in when my in-laws popped over with a big bag of plums, so thought it was worth trying this combination. Put all the ingredients into a large mixing bowl and leave to macerate for 2 hours. Pour into a preserving or large pan and place on a medium heat until it starts to boil. Increase the heat and boil for 15-20mins until setting point is reached. Turn off the heat and ladle into sterilized jars; seal. 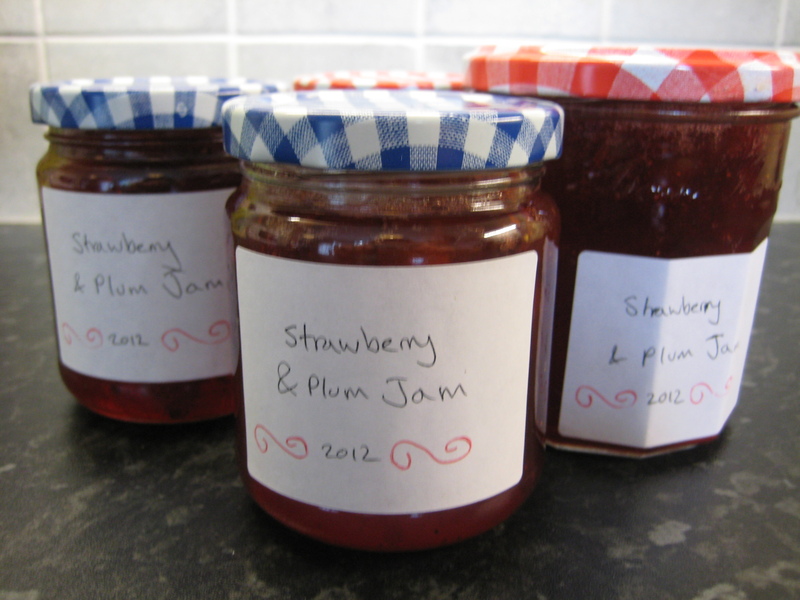 If you have never made jam before there are lots of ways of testing for a set. I prefer to put a teaspoon of the jam onto a chilled plate, return to the fridge for 30 seconds, then check to see if it has set. If not I heat the jam for a few more minutes and test again.